8 | TH E M R EP O RT TAKE 5 not a long-run reason for lack of construction; it's a short-run obstacle. M // What challenges are first- time homebuyers facing? 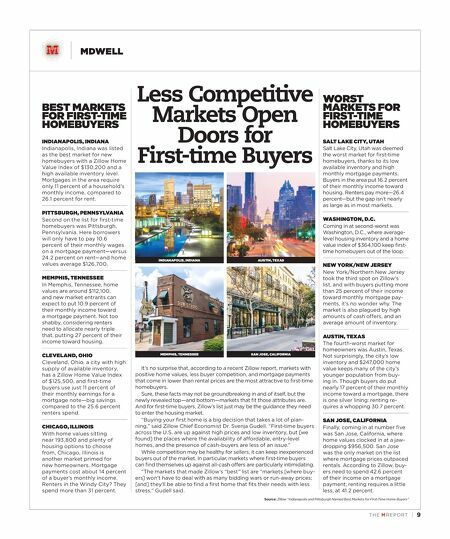 ROMEM // The answer for first time homebuyers is really short: higher prices. That means they need to come up with more of a down payment, which is harder. They often need to rely on their parents, if their parents can help them, and obviously that raises is - sues of fairness and social mobility. Another issue is that they need to save for longer, and that's hard to do when rents are going up in tan- dem with housing prices, so they're kind of in a squeeze. Young buyers have a harder time buying homes these days if they live in certain metro areas, and one of the options they have is to move to other parts of the country where there are still plentiful jobs but a lot more new construction. M // Where does home construction currently stand compared to recent months, as well as historical averages? ROMEM // Home construction is on the rise right now, and it is increasing for single-family homes as well; it's just not hit- ting the pre-recession levels or the level we saw in the early 2000s during the housing boom. Whether that's a good thing or a bad thing is not obvious. It's not trivial that we want to go up to those levels we were at then. The catch to understanding how this corresponds to low inventory is that there's not really a shortage of housing in America—there's a shortage of housing in specific places in America, and it's in those metro areas where there's a shortage of homes—because there is very strong demand for living there—that prices have been going up over the last three or four decades. M // What incentivizes builders to increase construction levels? What holds building back? ROMEM // Demand like we are seeing means builders can get a higher price for what they build, and high demand is the incentive to get builders to build. There are other factors that are preventing them from building, and very often those are rules. Another factor is a shortage of land on which to build, which to some extent is the result of geography, but within the built-up footprint it's a matter of rules more than anything else. The fact that within the built-up footprint there is less available land and often the land available involves demolishing something and building something instead that plays a role in limiting the supply of housing, too. Labor is also a current issue. It acts as a brake on construction because you need to gradually bring workers back into this sector, but that's The Stats Behind the Inventory Crisis The newest emerging crisis in the housing market is the continuous imbalance between supply and demand. Low supply of housing has been an ongoing issue, despite positive indicators from home sales and prices. 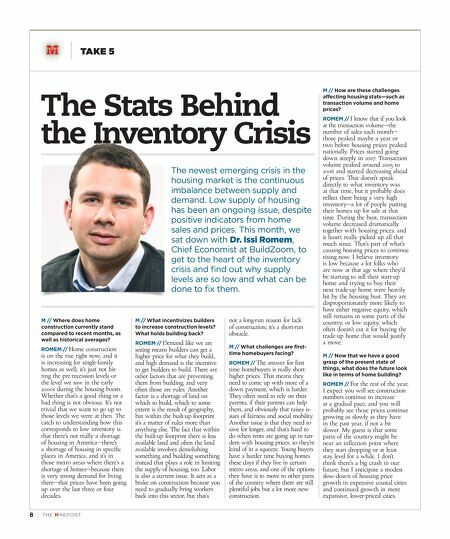 This month, we sat down with Dr. Issi Romem, Chief Economist at BuildZoom, to get to the heart of the inventory crisis and find out why supply levels are so low and what can be done to fix them. M // How are these challenges affecting housing stats—such as transaction volume and home prices? ROMEM // I know that if you look at the transaction volume—the number of sales each month— those peaked maybe a year or two before housing prices peaked nationally. Prices started going down steeply in 2007. Transaction volume peaked around 2005 to 2006 and started decreasing ahead of prices. That doesn't speak directly to what inventory was at that time, but it probably does reflect there being a very high inventory—a lot of people putting their homes up for sale at that time. During the bust, transaction volume decreased dramatically together with housing prices, and it hasn't really picked up all that much since. That's part of what's causing housing prices to continue rising now. I believe inventory is low because a lot folks who are now at that age where they'd be starting to sell their start-up home and trying to buy their next trade-up home were heavily hit by the housing bust. They are disproportionately more likely to have either negative equity, which still remains in some parts of the country, or low equity, which often doesn't cut it for buying the trade-up home that would justify a move. M // Now that we have a good grasp of the present state of things, what does the future look like in terms of home building? ROMEM // For the rest of the year, I expect you will see construction numbers continue to increase at a gradual pace, and you will probably see those prices continue growing as slowly as they have in the past year, if not a bit slower. My guess is that some parts of the country might be near an inflection point where they start dropping or at least stay level for a while. I don't think there's a big crash in our future, but I anticipate a modest slow-down of housing price growth in expensive coastal cities and continued growth in more expansive, lower-priced cities.